So, Just How Different Is Rupert Murdoch’s New Wall Street Journal? Rupert Murdoch made headlines this week with the resignation of Wall Street Journal managing editor Marcus Brauchli, a reported $580 million bid for Newsday and more talk of how he is transforming the Journal‘s front page coverage to take on the New York Times. How has the 119-year-old Journal changed since the Australian media magnate took over the paper on Dec. 13, 2007? A Project for Excellence in Journalism examination has the numbers. The study looked at the Journal front page every other weekday. 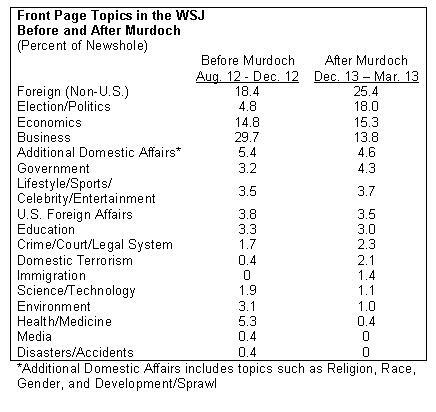 In the first four months of Murdoch’s stewardship, the Journal‘s front page has clearly shifted focus, de-emphasizing business coverage that was the paper’s franchise, while placing much more emphasis on domestic politics and devoting more attention to international issues. But it is not, at least not yet, as broad as the New York Times on the same days. Under the Murdoch regime, the single biggest change in front-page coverage occurred with politics and the presidential campaign. From Dec. 13, 2007 through March 13, 2008, coverage more than tripled, jumping to 18% of the newshole compared with 5% in the four months before the ownership change. Since the front page has a finite amount of space, that increase in political coverage seems to have come largely at the expense of business news. In the Murdoch era, coverage of corporate America has plunged by more than half — to 14% of the front-page space from 30% in the months before the sale. Coverage of government also increased a bit, rising to 4% from 3%. Aside from the business beat, other subjects that experienced drops in coverage under Murdoch include health and medicine, which fell to less than 1% from 5%. Transportation issues fell to 0% on the days studied from 3%. And the environment dropped to 1% from 3%. Several key categories appeared unchanged. Economics — which includes the faltering U.S. economy, the mortgage crisis and other macro concerns — remained at 15%. Coverage of foreign events in which the U.S. played a major role has been steady at 4%, as has lifestyle coverage (about 4%) and education (3%). One clear example of the changing news agenda was the Journal‘s front page on April 21, a day before the Pennsylvania primary. The paper led with a package of two campaign stories under the headline, “Latest Attacks Roil Democrats.” One story recalled Barack Obama’s political education as a Chicago politician and the other chronicled the growing concerns of Democratic Party leaders about the bitter primary battle. A more traditional Journal story — chronicling problems at smaller-to-midsize banks — sat at the bottom half of the page where it shared space with a piece about easing tensions between China and a small island controlled by Taiwan. So how does the news agenda of Murdoch’s Journal compare with that of the Times? An analysis of both papers’ front pages from Dec. 13–March 13 reveals that they are not the same, certainly not yet. When it comes to politics, the Journal, with 18% of the newshole devoted to the topic, has moved much closer to its possible new rival. But it has not caught up with the Times, which filled 27% of its newshole with politics in those four months. Despite the reduced coverage of business, the Journal‘s front pages still gave much more coverage to that issue (14%) than the Times did (4%). And the Journal generated considerably more coverage of economics (15%) than did the Times (9%). 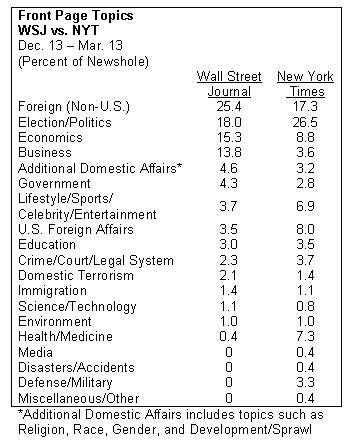 On the subject of foreign affairs involving the United States, the Times (at 8%) produced about twice as much coverage as the Journal (4%). But the boost in the Journal‘s coverage of international events not directly related to the U.S. (25%) surpassed the Times‘ attention to that subject (17%). It should be noted however, that the Journal‘s lead in that category stems from its interest in foreign business and economics, which combined to fill 9% of the paper’s front-page newshole. On the Times‘ front pages, international business and economics accounted for only 1% of the coverage. So thus far in the Murdoch era, the newly staked out battleground between the Journal and Times seems to be located mostly on the playing field of politics. Read more about current trends in the news media at journalism.org.